The original disc-detainer lock, the Abloy Classic. This article may require cleanup to meet Lockwiki's quality standards. Please improve this article if you can. A Disc-detainer (or disc lock, disk lock) is a lock design that uses rotating discs as locking components. In most designs the discs interface with a sidebar when properly rotated to allow them to actuate the locking bolt. Disc-detainers are primarily associated with Abloy locks, but ABUS, Kryptonite, and many knock-off brands have begun making them, too. The term disc tumbler usually refers to wafer designs, not disc-detainers. The first disc-detainer lock was the Abloy Classic, invented by Emil Henriksson in 1907. Disc detainer keys have angled bitting cuts that rotate discs. When rotated properly, a sidebar will fall into a gate on the discs allowing the key to turn further and actuate the locking bolt to lock or unlock the lock. Master keying is provided by wide or duplicate true gates on the discs themselves. Disc-detainer keys have angled bitting cuts to properly rotate each disc. Discs and washers used in a typical disc-detainer lock. Discs in the normal (blocking) position. Discs in the unlocked position; the sidebar can be retracted. A round metal disc, similar to a wafer, which is rotated by angled bitting cuts on the key. Discs have one or more true gates that must be properly aligned to allow the sidebar to retract and open the lock. Discs commonly use one or more false gates (typically gates too shallow to allow full sidebar retraction) to deter lockpicking attacks. Washers are thin metal wafers placed between each disc in the lock. washers ensure each disc is turned individually by the appropriate bitting cut on the key. The sidebar is the primary locking component of most disc-detainer locks. 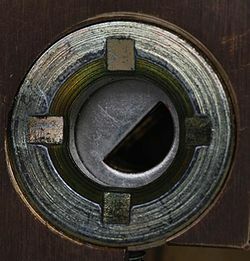 It is pushed into the cylinder or shell of the lock, preventing it from turning and actuating the bolt mecahnism until the sidebar is retracted. A disc-detainer pick for the ABUS Plus lock. Disc-detainers are subject to all the same attacks as traditional lock designs, though the tools used are less common. Lockpicking tools designed for disc-detainer locks closely resemble the 2-in-1 or 3-in-1 picks used with lever locks. 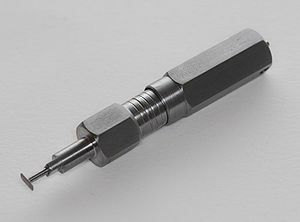 The main anti-lockpicking feature of disc-detainers is the use of false gates (or notches), but more advanced designs include a disc locking system that prevents discs from being individually manipulated. This page was last modified on 20 December 2010, at 12:02. This page has been accessed 154,948 times.